The End of Car Culture? 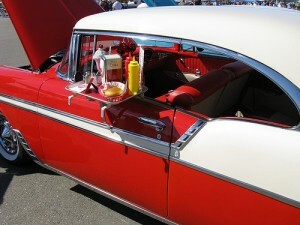 1950s car with a carhop tray clipped to the window. There was a time when dinner out meant sitting in your car. Families would drive up to places like A&W and Sonic Drive-In, park their cars and sit in them, waiting for carhops on roller skates to roll through and take their orders. The carhops brought out dinner trays that clipped to the car window, and families would enjoy a meal of hot dogs or hamburgers without ever getting out of the car. That was the 50s. Cars had fins, chrome and were as much about status as they were about conveyance. A shiny red Thunderbird was a way to indulge in and show off post-war prosperity. Soft leather seats were as comfortable as any restaurant booth; there really was no better place to be than the front seat of your car. However, as time wore on, Drive-thrus replaced Drive-ins, and McDonald’s takeout bags crumpled and tossed into the passenger seat replaced the carhop tray that clipped to the window. This is just one example of how far car culture has fallen. The consequences of mid-century car worship were far-reaching, and we are just beginning to correct them. Car culture led to the building of suburban and exurban developments that could only be navigated by car. Many people believe that the lack of walkable cities has contributed to our country’s obesity problem, and demand for walkability is continuously increasing. Additionally, our infrastructure is set up to favor cars, which in turn makes it difficult to get around without one, and when gas prices rise, people have no choice but to take big hits at the pump. It’s no surprise, then, that American car culture is on the wane. Sure, there are still people from older generations who have fond memories of Drive-In movies, road trips and shiny chrome, but younger generations are embracing technology over cars. This article from Minnesota Public Radio illustrates this by taking us to a high school in Wisconsin, where the parking lot is mostly empty: many of today’s youth are eschewing driver’s licenses. Bikes and public transit are beginning to replace cars. However, a major shift toward a bike-and-transit centered infrastructure — which is more sustainable and healthier for everyone — is going to come only after major improvements to our roads. Our streets are still set up to favor drivers, which puts cyclists and pedestrians at risks. There are still places that are not easy (or even possible) to reach by public transit. And cyclists are still experiencing backlash from drivers who resent having to share the road that has been, for the last half century, exclusively theirs. But change is well within our grasp. The glamour of car ownership is long gone and without the glamour, what is left? Meanwhile, when people get used to taking in fresh air in walkable cities, the health benefits of biking and the economic efficiency of public transit, they may begin to view car culture they way we view horses and buggies: cute, quaint and completely impractical. Wonderful article Jack. Very interesting. I can relate to the part about school in Wisconsin. One of my daughters even though she has her license she is wanting to get a bike because it will be more convenient for her to get around her college campus in the fall. I know when I decided to take up commuting by bike I was doing it just to save on my cost of commuting. That was a few years ago. Now to hear this about my daughter I think your article hit the nail on the head. After reading the article at the timesunion I think the fairy tale lifestyle that people are wanting is the lifestyle of the US in the 1950′s & 60′s. You know like what was on TV at that time. Where everyone knew everyone in a small town and you were on first name basis with your local butcher, barber, and everyone went to church on Sunday. Not sure if this is really possible these days. Maybe in small secluded areas but most of our large cities would be hard press to fit in this kind of mold. My suggestion would be to live in a small town and not desire the higher paying jobs in the big cities. My home town is very much like this but most people could not get a job is such a place including myself so that is why I am here in the big city still wishing I was back in the small town that seem to have been frozen in time in the 1950′s. Bikes shall inherit the earth! I wish your daughter the best of luck at college!